John C. Traynor spent his early years in New Jersey. His art studies began at Delbarton School in Morristown New Jersey; from there he went to Paier College of Art in New Haven Connecticut, starting at the age of 16. He studied figure painting at the Art Students League of New York, as a merit scholar, with Frank Mason, as well as landscape painting with Mason in Vermont. John followed his studies with Mason by spending a year studying sculpture in Italy. Having completed his studies by the time he was 20 years old, John was determined to become a professional artist. As an unknown artist John started selling his paintings at outdoor art shows, in the Northeast where he was able to meet collectors in person. This exposure opened opportunities with galleries. Traynor has won numerous awards including the Frank DuMond award from the Hudson Valley Art Association and the Medal of Honor from the Salmagundi Club of which he is an honorary member. In addition, John is also an inductee into the Delbarton School Hall of Honors and attained the level of Copley Master from the Copley Society of Boston. 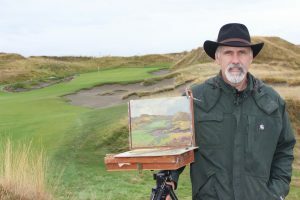 John has made numerous painting expeditions to Ireland as well as trips to Holland, Italy, France, England, Scotland, Austria, Israel and many locations across the United States including Hawaii. John currently resides in southern New Hampshire in a quaint New England village with his wife Liz. Surrounding their home are many gardens that inspire John’s paintings. John is a skillful painter of every genre: landscape, still life and portraiture. His unique blend of realism and atmospheric impressionism set his work apart. Many people can recognize a “Traynor painting” by its brush strokes and unique feeling. Part of his success is connecting emotionally with others through his work reminding people of moments in their life or memories of the past. What inspires John is nature and what he sees around him whether it is the flowers from his gardens, people in his life or the landscape outdoors. John’s interpretation of his subject matter is influenced from artists of the past. His use of light and atmospheric effect is reminiscent of the old master painters such as the American tonality painters and the French Impressionist artists. There is a richness and fullness to his work that is ‘old world’ yet contemporary with his unique style. Works of art range from 9 by 12-inch miniatures to 40- by 50-foot murals. Painting outdoors on location is a primary source of inspiration for Traynor’s landscapes. Smaller paintings are finished indoors, or used as studies for larger works painted in his studio. Portraits are painted on a commissioned basis in his studio or the home of the person or persons to be portrayed. John gets asked questions often through email, at his shows and in his classes. He thought it would be fun to share these questions and answers with you. If you have any questions for him, email him at mail@johnctraynor.com. Enjoy! Q: How often do you paint? A: Every day that I’m not traveling. A: Nature inspires me when I’m outside painting. When I’m in the studio I just start painting and the inspiration comes. Q: Where are you when not painting? A: In the warm weather I enjoy playing golf and in the winter I like to ski when I get a chance. Q: What do you do to challenge yourself? A: I like to do large paintings as a challenge. Q: Do you think someone is born an artist or taught? A: Anyone can be taught to paint but you have to be born an artist. Q: If you could have a conversation with any non-living artist who would it be and why? A: None because looking at their work is so inspiring to me. Q: How do you know a painting is complete? A: When it gives the impression to the viewer that I want to give. Q: Do you prefer to paint inside or outside? A: I like to do both. Although its more of a process to paint outside. I mostly paint outside to learn from nature. Q: What is your favorite subject to paint? A: People are probably my favorite subject. A: Spending time with my friends and family. I also enjoy jogging in the morning with my dogs. Q: Do you have a favorite painting? A: No, all of my paintings are my creations and they all have meaning to me. I especially enjoy finding new paintings from past artists that inspire me.